Contrarian investing is a type of investment strategy distinguished by buying and selling against the grain of investor sentiment during a specific time. A contrarian investor enters the market when others are feeling negative about it and the value is lower than its intrinsic value. When there is an overarching pessimistic sentiment on a stock, it has the possibility of lowering the price so low, the downfalls and risks of the company’s stock are overblown. What is the retail investing community aka “dumb money” doing? (Reuters) – Sales of U.S. Mint American Eagle gold and silver coins fell sharply year-over-year in November, keeping their tally for the first 11 months of 2017 on track for the weakest year since 2007, the latest data showed on Thursday. U.S. Mint data showed its sales of American Eagle gold coins totaled 12,000 ounces in November, down 92 percent from November 2016. This placed sales for 2017 so far at 259,500 ounces, on track for the lowest in 10 years. Sales of American Eagle silver coins reached 385,000 ounces in November, down 87 percent from November 2016, and bringing year-to-date sales to 17.3 million ounces, also on track for the lowest in 10 years. The speculation premium is low or null (almost no buying and we have been trending lower for over a year, unlike almost everything else). There is little to no fear among retail investors (complacency is high). Basically, there is very little appetite for physical gold and silver because few retail investors are afraid and/or few are betting on higher prices. 10 year lows suggest that we should be pretty close to some kind of large shift in the precious metals market. Commodities vs equities. Source: Incrementum AG. 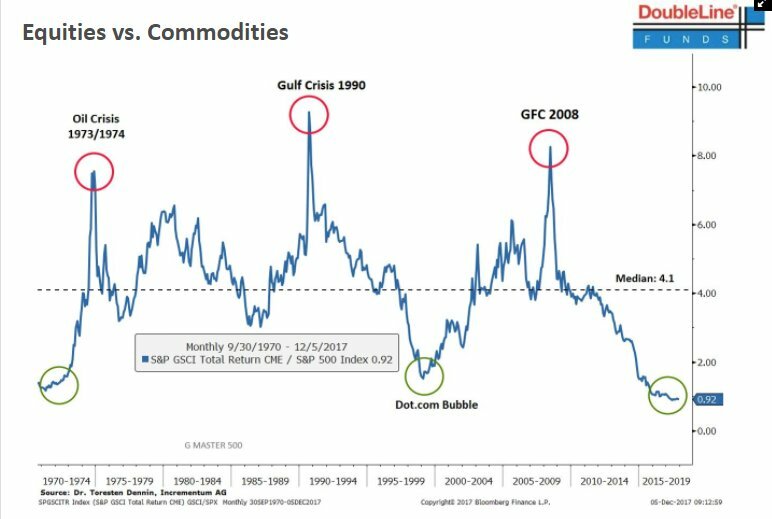 Commodities overall are the cheapest they have ever been since at least 1970. That should be enough for any contrarian to start salivating. I mean, we are theoretically talking about the absolute best entry point in over 45 years. We are basically talking about a once in a generation opportunity. Precious metals miners vs S&P 500. Source: Incrementum AG. 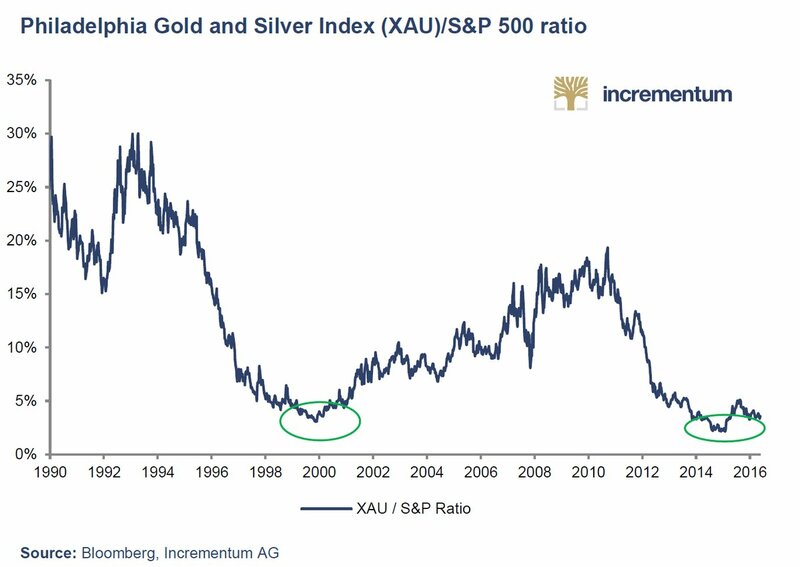 The XAU/S&P 500 ratio is at the same level that marked the start of the epic 11-year precious metals bull market in 2000 and is barely above the 35-year lows seen in 2015/2016. Again, this suggest that precious metals miners are trading near a generational low versus equities. Here we can see that the miners/gold ratio is barely off a so far 7-year low. 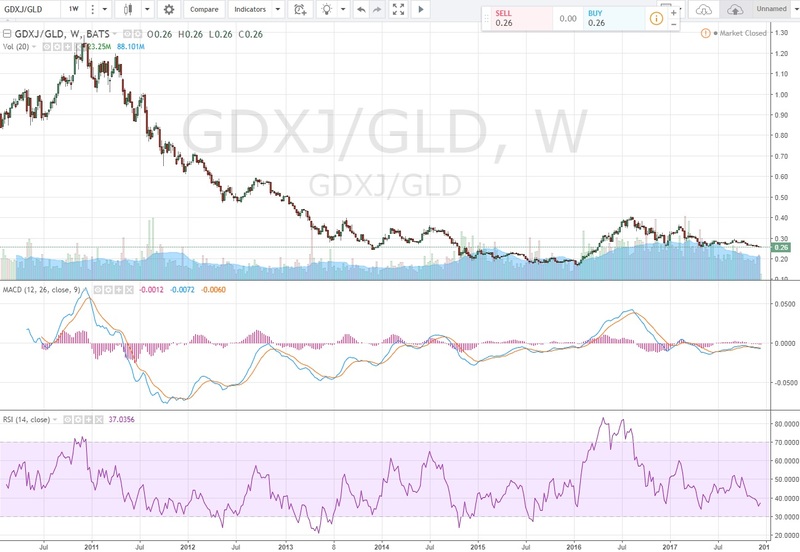 One thing to keep in mind is that I believe a lot of the companies included in the GDXJ are in much better shape than when the ratio was at similar levels back in 2014 for example. With that said, many a miner has raised capital and diluted shareholders in varying degrees since 2014. 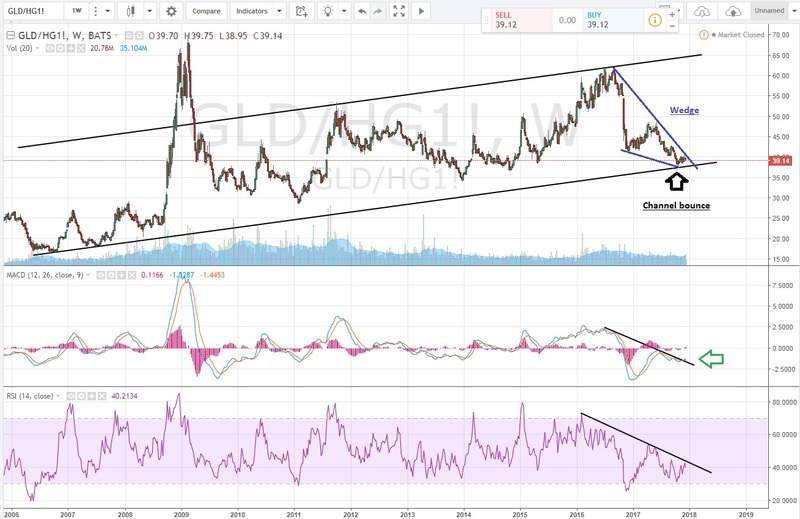 Gold (GLD) vs Copper (HG1!). The gold/copper ratio looks to have bounced off a multi year support trend line and is close to breaking out of a wedge (in blue). Large speculators (“dumb money”) are reducing long positions and adding shorts. Commercials (“smart money”) are adding long positions and heavily reducing short positions. M2-velocity. Source: St Louis FED. First of all, to get inflation, money must be changing hands. The higher the velocity of money, the stronger the inflation pressure is because every currency unit is bidding on more goods and services. 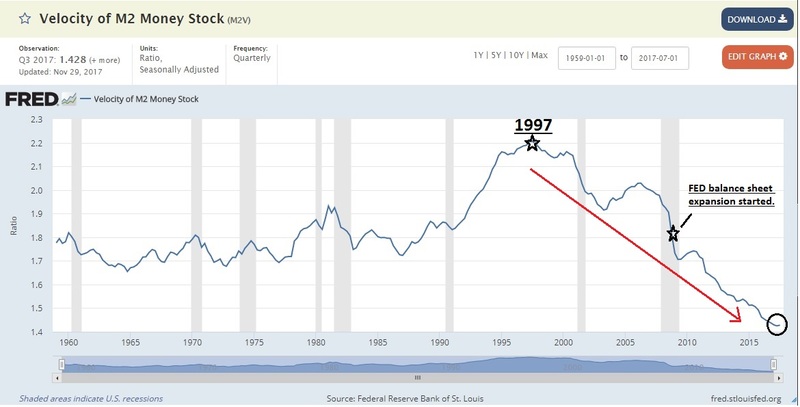 As you can see in the graph above, money velocity has been going down hill ever since it peaked in 1997. This is the reason why inflation hasn’t gotten out of control despite the FED having pumped trillions of new currency units. Basically, velocity of money has been going down while the FED has been printing tonnes of money. Now IF we are witnessing a bottom in money velocity and it starts to pick up, we might soon start to see inflation really kick off given the the huge amount of currency units in the system nowadays. Retail investors/speculators (“dumb money”) have capitulated and are extremely complacent. Commodities are trading at a generational low versus general equities. Precious metals miners are trading near generational lows versus general equities. Precious metals miners are trading near 7-year lows versus gold. Gold/copper ratio looks to have bounced from the lower support line in a multi year bullish channel. COT-report is getting increasingly bullish. Velocity of money is potentially at a turning point. I am personally extremely bullish on the precious metals, and even more bullish on the precious metals miners. I still see people calling for sub $1000 gold and sub $8 silver, but I can’t bare myself to sit still given the increasing amount of bullish (contrarian) factors. Many miners are cheap relative to the underlying metals, and commodities overall are almost the cheapest they have ever been relative to financial assets. Just imagine if we finally do get that inflation spike that the FED has been trying to conjure up since “forever”. That could potentially result in a perfect storm for the precious metals miners, and that is why I am basically all in on this sector. The fact that FED’s Kashkari recently tweeted that he thought the FED should up the inflation target is probably a tell of what he sees coming. With that said, every person is responsible for their own investment decisions and there are a lot of risks associated with investing in miners.